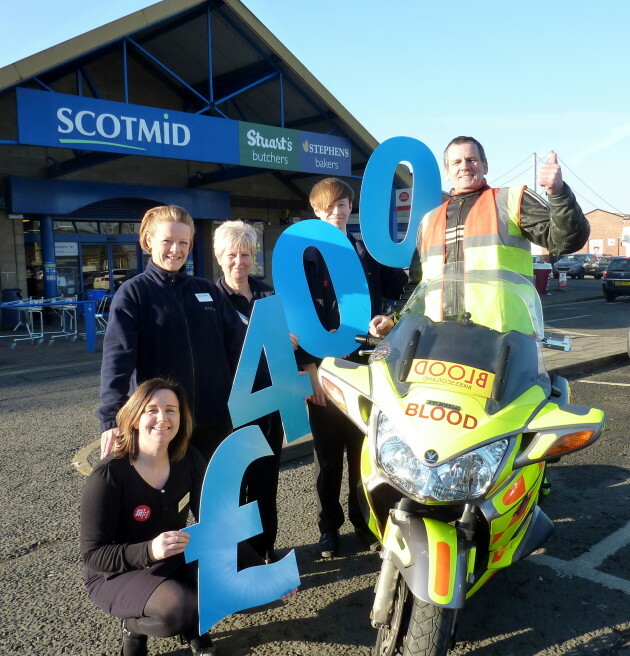 A group of big-hearted bikers who provide a life-saving service have been awarded a £400 community grant by SCOTMID co-operative. Blood Bikes Scotland, run completely by volunteers, delivers urgently-needed blood and supplies to NHS hospitals, free of charge, where they would normally use a courier or taxi service, freeing up valuable resources. The grant will be put towards running costs such as road tax and insurance for the motorcycles and public liability insurance for the riders. Established in 2012, Blood Bikes Scotland delivers blood products between hospitals from Monday to Thursday 7pm to 6am, Friday 7pm to Monday 6am and 24 hours during public holidays, 365 days a year. Blood Bikes Scotland currently has 2 motorcycles and 21 volunteer riders based between Edinburgh and Hawick. The charity will soon be trialling a courier service between the Blood Transfusion Service at Lauriston Place in Edinburgh to hospitals in the Scottish Borders and is looking to eventually extend the provision to the whole of the Lothians, Borders and Fife.